All your favorite flavors of Kalamata olives, feta cheese, capers, and red onion shine in my Mediterranean Deviled Eggs. A tasty twist on a classic! 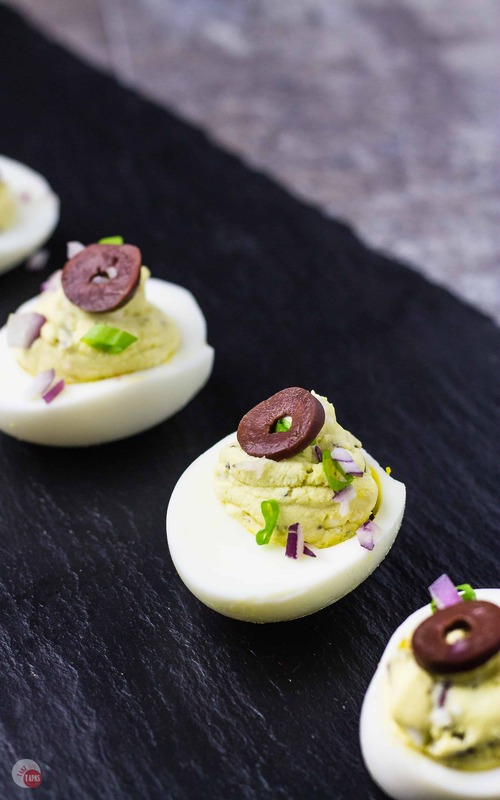 Deviled eggs are such an amazing food! Easy to prepare, full of protein, and really the only way I like eggs except for in a cake, brownies, or other baked desserts. Making deviled eggs starts with hard-boiled eggs. Before you go all “you should make it from scratch to avoid the preservatives” on me, you can get organic cooked ones. They might be a little pricier but you do PAY for the ease of having them already cooked perfectly! Greek salads are right up there on my list of fave foods. I can’t resist the combination of the crisp lettuce and cucumbers mixed in with the briny olives and salty feta. Throw in some spicy red onion and a great dressing and I am in heaven! I can eat it in the summer and in the winter with a warm bowl of soup. The tastes of the Mediterranean also include nuts, seeds, and beans which I love to add to my salads as a way to get extra protein. Especially on Meatless Mondays or if you are having vegetarians over for dinner. My Mediterranean Deviled Eggs have all these flavors but you can also add the seeds and nuts and even some chickpeas to them as well. 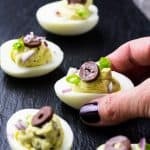 These Mediterranean Deviled Eggs rank right up there with my Reuben Deviled Eggs that I made for St. Patrick’s Day and these amazingly cute Easter Bunny Deviled Eggs from my Girl Michelle at WestViaMidwest! The creamy and savory egg yolks are the perfect backdrop for the crispy bite of the red onion, the briny taste of the Kalamata olives, the salty burst you get when you bite into a caper, and the texture of the feta cheese. What a way to kick off spring isn’t it? 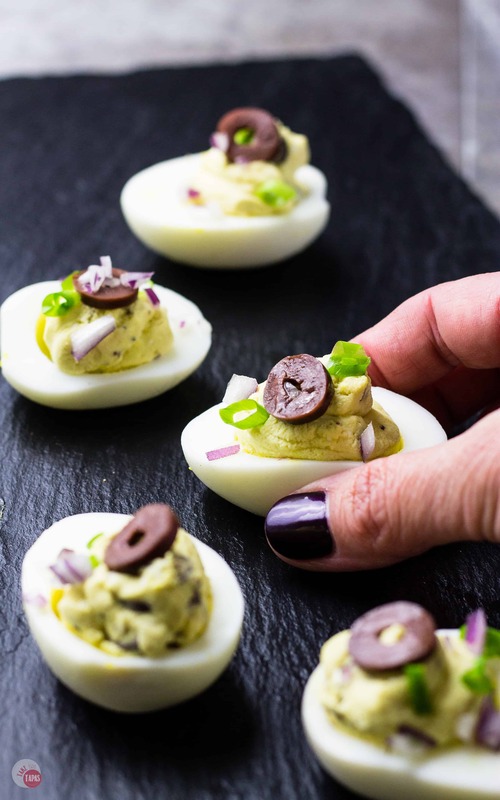 Whether you are using all your leftover eggs from Easter or planning an epic Mother’s Day brunch that just would not be complete without a tray of deviled eggs, my Mediterranean deviled eggs will be a crowd pleaser for sure! 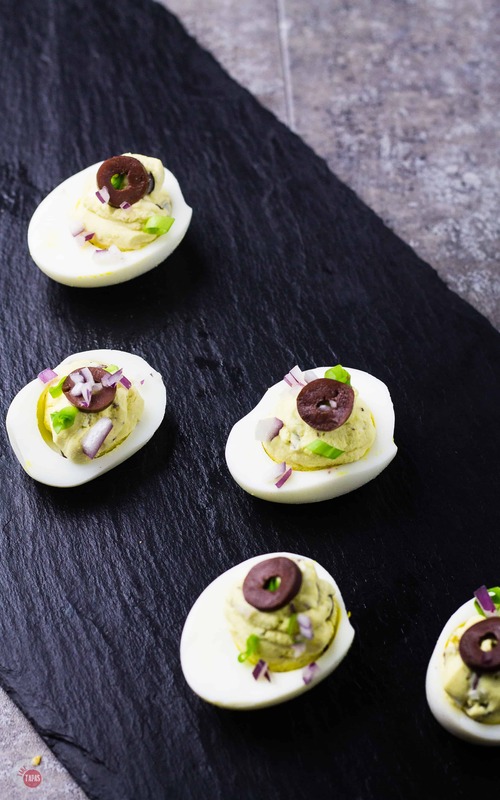 This deviled egg salad from Dish of Daily Life is a great way to use these Mediterranean deviled eggs or any deviled egg! Feel free to serve these amazing deviled eggs on this trifle bowl or this slate platter. I saw these last night and promptly made a batch this morning… Holy moly the olive juice and feta is such a flavor boost! My husband sat down and ate the rest of the batch …. needless to say we will be making these again soon!